Apo-Nicotinic (Nicotinic Acid) is given to patients to help prevent and treat pellagra (a niacin deficiency). Its active ingredient is a type of B vitamin which is important in helping the body's metabolism. Symptoms of a niacin deficiency can include redness of the tongue, peeling of the skin and diarrhoea. Apo-Nicotinic (Nicotinic Acid) is given to patients to help prevent and treat pellagra (a niacin deficiency). Its active ingredient is a type of B vitamin which is important in helping the body's metabolism. Symptoms of a niacin deficiency can include redness of the tongue, peeling of the skin and diarrhoea. Treating a niacin deficiency can help to alleviate these symptoms while also helping the nerves to function properly. In some cases, doctors may prescribe this to patients to help lower cholesterol and reduce levels of triglycerides (fat). 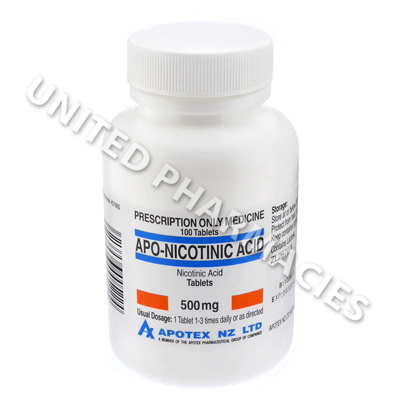 Apo-Nicotinic (Nicotinic Acid) comes in the form of tablets. Take each tablet with a meal or light snack and a glass of water. It is possible that your doctor will tell you to take it 1 to 3 times per day. The dosage may be different for patients taking it to lower cholesterol. Always follow the instructions provided by your doctor and never exceed the prescribed dosage. Your doctor may provide special instructions to you in order to avoid flushing after taking this medication. If any of these side effects persist or become worse, you should immediately consult your doctor. There is also a slight risk of more severe side effects occurring in patients who take this medication. Seek immediate medical attention if you notice a severe headache, muscle pain, changes in vision, inflammation of the limbs, unusual bleeding or any other side effects not listed here. In some cases, this medication may cause the patient's blood sugar levels to increase. This may cause a worsening of diabetes. Patients suffering from diabetes should tell their doctor before taking this medication. This medication is known to pass into breast milk. Always use Apo-Nicotinic (Nicotinic Acid) as you have been prescribed by your doctor. Never self-medicate or change your dosage without first consulting your doctor. The correct dosage can vary depending on your health, medical history, and the severity of the condition being treated.